This entry was posted in beverages, cocktails, gluten free, vegan, vegetarian, winter and tagged ginger cocktails, ginger vodka, gluten free cocktails, infused vodka, infused vodka cocktails, lemon cocktails, lemon ginger cocktails, winter cocktails on December 26, 2017 by Michele Humlan. Given the choice : homemade treat made with love, or store bought. Tough choice, huh? Bet you got it right! The thrill of knowing someone has taken the time, and effort, to craft an edible gift just for you? Well, priceless. That’s what this recipe is all about. 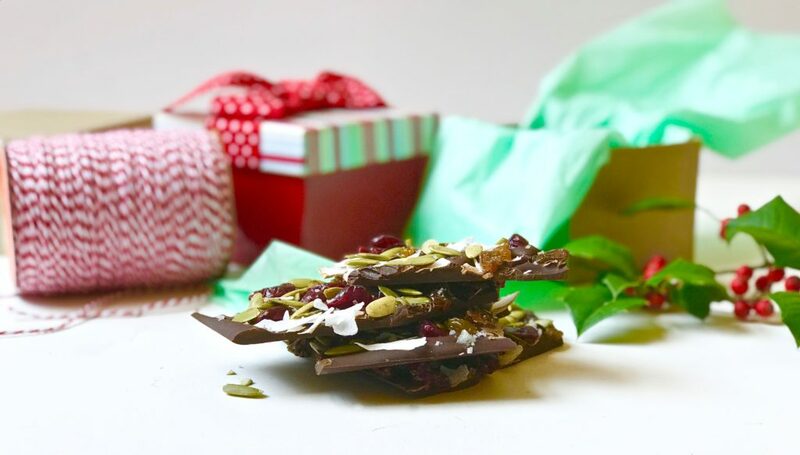 This entry was posted in desserts, gluten free, vegan, vegetarian, winter and tagged chocolate bark, chocolate candy, christmas candy, coconut flakes, dried cranberries, holiday candy, homemade christmas candy, pepitas, pistachios, sweet and salty desserts on December 8, 2017 by Michele Humlan.